Whether it’s a lifelong dream or a weekend getaway, Amherst Federal Credit Union offers a variety of great savings options to help you get there. Our deposit accounts let you earn competitive interest rates while keeping your money totally liquid so you can get to it when you need it. The National Credit Union Administration (NCUA) federally insures our credit union and each member’s deposits are backed by the full faith and credit of the United States Government to $250,000. Every member is an owner of the Credit Union. A deposit of one share – $5.00 – is required for membership. Shares held in a savings account are the primary benefit of that ownership. Dividends are declared and paid quarterly by the Board of Directors. Statements are sent to members quarterly along with a copy of our newsletter. Conveniently make a deposit or withdrawal by phone, fax or mail. Please be sure to give us your daytime phone number, exact directions of your request and include account numbers if possible. Attention to these details will help us provide quick, accurate service – just the way you want it. We may call you or ask for identification to verify the transaction. When a member’s Share Account is inactive for two or more years and the balance is less than $100, an account fee of $6.00 is charged each quarter. An account is considered “inactive” when there is no deposit or withdrawal by the member. Payment of dividends is not classified as account activity. After five years of inactivity, the account is declared abandoned under New York State Law and turned over to the Office of the State Controller. Our checking account service is available to every qualified member. Your first 50 checks are free and you may apply for a ATM or Visa check card. With our free online Home Banking you can access your account balances, make transfers, nickname accounts, view statements and much more! Easy-to-read and easy-to-use monthly statements are also provided. Save your checks and manage your bills online with free bill pay. No monthly service fees apply. We recommend payroll deduction or direct deposit as a convenient way to make deposits. In order to keep account costs to a minimum, paid checks are not returned. Copies of paid checks, if needed, can be requested through our office at a small fee. As a community credit union, Amherst FCU strives to offer products and services to helps members obtain low cost, reliable service with personalized attention to the financial needs of every member. We realize that some members may not be eligible for a regular share draft (checking) account due to past account use or unforeseen circumstances. The Fresh Start Checking account offers a second chance to bank responsibly, ideally leading up to full share draft account access. Now you may have the same type of access to your money as anyone with a regular checking account, but for much less than dealing with check cashers. Restrictions and monthly fees apply. Each application is subject to management approval based on the applicant’s ChexSystems report. Not all members will qualify. Call the credit union for more information. ATM service is available for deposits and withdrawals from Shares (Savings) Accounts and Share Draft (Checking) Accounts. Visa® check cards work just like a credit card only the funds are taken directly from your checking account. Use your check card for purchases or cash withdrawals from an ATM. The Visa® check card may be used in conjunction with Overdraft Protection so you never have to worry about the cost and inconvenience of bouncing a check. Since the card carries the Visa® logo, it is accepted worldwide. Use your Check Card or ATM card for withdrawals from your savings or checking account with the credit union. Your first 6 transactions a month are surcharge free at any Allpoint or M&T Bank ATM. Please keep in mind that there may be transaction fees and/or surcharge fees that apply. Check out Allpoint’s online ATM locator or download the free smart phone application to find ATMs on the go! Enroll for payroll deduction or Direct Deposit to be sure to have enough money set aside for holiday expenses. Make automatic deposits every payday. Club money is automatically transferred into your share (savings) account around the 1st of November. Overdraft protection is available at $2.00 per transaction plus interest, until the cash advance is repaid. Overdraft protection for qualified members prevents checks from being returned due to Non Sufficient Funds. Term share certificates are similar to certificates of deposit offered by other financial institutions. The interest rate is guaranteed for the term of the deposit. We offer one year terms at very competitive rates. Our minimum term share certificate deposit is $1,000.00. When it’s time to open a new certificate or roll over an old one, be sure to compare our rates to other area institutions. Like all Credit Union deposits, our Certificates are insured by NCUA through the NCUSIF, an agency of the federal government. Use our Term Share Certificates for regular, Roth and Education IRA accounts. Ask about contributory IRA accounts to build your balance each payday until it’s large enough for a Term Share Certificate. Every member is an owner of the Credit Union. A deposit of one share – $5.00 – is required for membership. Shares held in a savings account are the primary benefit of that ownership. Dividends are declared and paid quarterly by the Board of Directors. Statements are sent to members quarterly along with a copy of our newsletter. Online access to your accounts is available to all members at no charge. Transfer funds, check balances, view cleared checks (if available) and verify transactions all from the comfort and convenience of your own home. It’s fast, it’s safe and it’s FREE! AFCU’s Mobile Banking site will automatically launch when using your smartphone or tablet. Home Banking services are done in real time. Please keep in mind that most transactions will be posted the same business day but others may take longer due to unforeseen circumstances. Free Bill Pay is also available. Deposit checks from your smartphone with our Mobile Check Deposit applications for iPhone, iPad and Android devices! To request access please send a written and signed request to the credit union office or stop by. You must specify if you wish to enroll your share (savings) or share draft (checking) account. Enrollment in our Mobile Check Deposit program is subject to approval based on account usage and member history. In addition to your share (savings account), an Amherst FCU checking account is available to every qualified member. Your first 50 checks are free. No monthly service fees apply. Account statements are issued monthly or may be viewed online. Starting your first job or trying to save money? Amherst FCU accepts both Direct Deposit (entire paycheck) and Payroll Deduction (as little as $5.00/pay) from most employers. Setting up a Direct Deposit or Payroll Deduction is a great way to save and allow quick and easy access to your funds or to build your savings. This service may be changed at any time upon your request. Use your ATM card for withdrawals from your savings or checking account with the credit union. You may use your card at any Allpoint or M&T Bank ATM machine, where your first 6 transactions a month are surcharge free. Visa® check cards work just like a credit card only the funds are taken directly from your checking account. Use your check card for purchases or cash withdrawals from an ATM. Since the card carries the Visa® logo, it is accepted worldwide. Use your Check Card or ATM card for withdrawals from your savings or checking account with the credit union. Your first 6 transactions a month are surcharge free at any Allpoint or M&T Bank ATM. Please keep in mind that there may be transaction fees and/or surcharge fees that apply. Check out Allpoint’s ATM locator on our website or download the free smart phone application to find ATMs on the go! The Hughes/Demmin scholarship program honors the contributions of past managers Lawrence Hughes and Peter Demmin. In May 2012, with a heavy heart we said goodbye to these two dedicated men who worked diligently to grow our credit union to what it is today. The Hughes/Demmin Memorial Scholarship is annually awarded to two deserving young members in the amounts of $1,000 each. Applications are due to Amherst FCU by April 1, 2019. Amherst FCU also participates in the New York Credit Union Administration’s scholarship program. Multiple scholarships are awarded in the amounts of $200-$1,000. Applications are due to Amherst FCU by January 4, 2019. New this year, Amherst FCU is now offering a special scholarship for Amherst High School students enrolled in the Amherst Academies program! One high school senior will be awarded $500 towards educational expenses. Applications are due to Amherst FCU by April 1, 2019. The 2019 scholarships have expired! The Amherst FCU staff and board of director are excited to announce our partnership with the Amherst Academies to launch a student-run credit union branch at Amherst High School! The Amherst Academies are a comprehensive Career and Technical Education program with the goal of preparing students for lifelong success. Students applied and interviewed for positions at the school branch and those selected will be thoroughly trained in customer service and cash handling. Their role in running the school branch, under the supervision of an Amherst FCU employee, will to be assist students, faculty and staff with basic transactions and new accounts. Our goal is to provide students valuable professional experience from the convenience and safety of their school and to encourage positive financial habits. For the safety and security of Amherst High School, access to the student-run branch is limited to Amherst High School students, faculty, staff and administration only. The school branch will during lunch hours every Friday in which school is in session. The Amherst High School Credit Union branch has been made possible, in part, by a grant from the New York Credit Union Foundation. Business Share Accounts are available for small businesses- DBA’s or Partnerships. In order to establish membership, a share account must be opened. A deposit of one share – $5.00 – is required for membership. Shares held in a savings account are the primary benefit of that ownership. Dividends are declared and paid quarterly by the Board of Directors. E-Statements are sent to members quarterly along with a copy of our newsletter. ATM service is available for withdrawals from Shares (Savings) Accounts and Share Draft (Checking) Accounts. All business accounts are subject to the same fee schedule as member accounts. When a Share Account is inactive for two or more years and the balance is less than $100, an account fee of $6.00 is charged each quarter. An account is considered “inactive” when there is no deposit or withdrawal by the member. Payment of dividends is not classified as account activity. After five years of inactivity, the account is declared abandoned under New York State Law and turned over to the Office of the State Controller. Our checking account service is available to every qualified member who has a share account. There are no minimum balance requirements for share draft accounts. Share Draft accounts do not earn a dividend. You may apply for an ATM or Visa® Check cards to be used with this account, and your first 50 checks are free. Surcharges are sent by the owner of the ATM and are normally taken as part of the withdrawal from your account. This fee is waived for the first 6 transactions each month. Use your Check Card or ATM card for withdrawals from your savings or checking account with the credit union. Your first 6 transactions a month are surcharge free at any Allpoint or M&T Bank ATM. Please keep in mind that there may be transaction fees and/or surcharge fees that apply. Check out Allpoint’s online ATM locator or download the free smart phone applicationsto find ATMs on the go! Use your ATM card for withdrawals from your savings or checking account with the credit union. You may use your card at any Allpoint or M&T Bank ATM machine, where you first 6 transactions a month are surcharge free. Visa check cards are most often used in the place of writing a check. There is no need to carry cash; it works just like a credit card. The funds are taken directly from your checking account for purchases or cash withdrawals from an ATM machine. The Visa check card may be used in conjunction with overdraft protection so you never have to worry about the cost and inconvenience of bouncing a check. Since the card carries the Visa logo, it is accepted worldwide. Online access to your accounts is available to all members at no charge. Transfer funds, check balances, view cleared checks (if available) and verify transactions all from the comfort and convenience of your own home. It’s fast, it’s safe and it’s FREE! 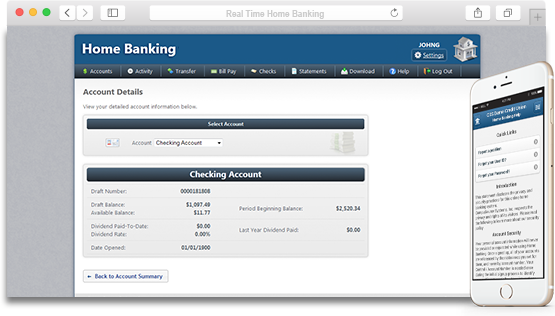 Home Banking services are done in real time. Please keep in mind that most transactions will be posted the same business day but others may take longer due to unforeseen circumstances. Bank on your time, anywhere! View account balances, transfer funds and more, all from the palm of your hand. Deposit checks from your smartphone with our new Mobile Check Deposit applications for iPhone, iPad and Android devices! To request access please send a written and signed request to the credit union office or stop by. You must specify if you wish to enroll your share (savings) or share draft (checking) account. Once you have been approved, please take the time to read our disclosure before proceeding with downloading the application. Your usage of the Mobile Check Deposit application is subject to your cell phone carrier’s regular data fees. After you’ve been enrolled through the AFCU office, you may access Mobile Check Deposit by logging into your Mobile/Home Banking account from your smartphone or tablet. Select Check Deposit (RDC) from the Home Banking menu. When a pop-up box appears, press Cancel to be directed to your phone’s application store to download the Mobile Check Deposit application. Press OK if you have already installed the application. Your Mobile Check Deposit application will open (no separate login needed), prompting you to enter the amount of the check and to take photos of the front and back of the check. You are responsible for retaining the check for 90 days. Enrollment in our Mobile Check Deposit program is subject to approval based on account usage and member history. For more information, please call the credit union at 634-3881. Pay your bills online with a click of the mouse! Once you are enrolled in our free electronic bill payment, you may set up payees, individuals or businesses to which you want to make payments to. You will create payment schedules and either set up a one-time payment or recurring payments. We offer low rates and competitive terms on loans for new and used auto loans, recreational vehicle loans, personal loans and share secured loans. There are no application fees! Please call the credit union at (716) 634-3881 if you have any questions about our loan products. Searching for just the right vehicle can be extremely time consuming. Don’t waste additional time searching for a place to finance your loan. Our rates are competitive and we can often match or beat most dealers’ rates. The loan application process is quick and convenient, and the service you’ll receive is friendly and efficient. We finance both new and used vehicles and motorcycles. View Forms and Applications. Transfer your vehicle loan from any other lender to take advantage of our low rates. This is especially attractive during our Car Loan Sales, offered four or five times a year, featuring extra low rates and special bonuses. Our partner, Enterprise Car Sales, offers premium used cars with new vehicle-type warranties. Enterprise has specials for Credit Union members several times a year. With their no haggle policy, you are sure to get a great deal with a car from Enterprise and a loan from your credit union. The credit union also offers financing for boats, RVs, travel trailers, jet skis, and snowmobiles at competitive rates. Let us help you finance your dream vehicle! Personal Loans are available to qualified members for any worthwhile purpose in any amount from $500 to $12,000. Use this kind of loan for a wide variety of expenses such as home improvement, medical or legal expenses, education expenses, debt consolidation or taxes. View Forms and Applications. Debt Consolidation Loans are available as either a Visa credit card balance transfer, a signature loan, or a home equity fixed-rate loan. Make an appointment with one of our staff members for assistance with the management of your current debts. Use this low-rate loan to obtain a loan while still keeping your savings account intact. Use your shares or term share certificate to secure your loan. Loans may be secured by offering other insured, independently appraised, personal property or investments such as stocks, bonds or certified shares in a mutual fund. Call our office to ask for details. AFCU participates in the Thank a Vet discount program through the Erie County Clerk’s Office. AFCU offers ½% discount off of the applicant’s qualifying rate for any personal loan or new/used auto loan held elsewhere. The program-issued photo I.D. card must be presented. For more information please visit the Thank a Vet program website. All applications subject to approval. Buying and owning a home is certainly a worthwhile financial goal, but some aspects of the process can be complex, expensive, and downright exasperating. We’re here to make this experience enjoyable – and to keep your stress level and payments low! As members of the New York State Credit Union League, we use their agency, OwnersChoice Funding (formerly CUC Mortgage) to provide Home Mortgage Loans and servicing for our members. Rates change daily. When it’s time for a new home purchase, or time to refinance an existing loan, call us first (716-634-3881) to get our current rate. AFCU can help you get things started with prompt, personalized service in the credit union style. Click here for more information on OwnersChoice Funding. A “Mini” Home Equity Loan is a convenient, affordable way to turn equity in your home into a ready source of cash for almost anything you need. Do you need extra money quickly without extra paperwork or hassles? Do you own your own home? Inquire about a “Mini” Home Equity, it may be the perfect answer. Call our loan department for more information at (716) 634-3881 or click here for a printable application. Certain terms and conditions apply. This service is an open end Line of Credit designed for members interested in a Home Equity Loan with the convenience of a line of credit. Members are able to take advances as needed, rather than a lump sum. A line of credit is easy, convenient and the interest is tax deductible! Contact our loan department for more details or click here for a printable application. Choose between a variable rate and a fixed rate. The variable rate is tied to prime rate and may change only two times per year. The SAFE Act requires financial institutions that originate mortgage loans (Home Equity Loans, Home Equity Lines of Credit, Mini Equity Loans and First Mortgages) to register with the Nationwide Mortgage Licensing System & Registry (NMLS). Loan Officers at financial institutions that are involved with mortgage loans in any aspect are considered Mortgage Loan Originators (MLO) and must also be individually registered with the NMLS. Each financial institution and MLO are assigned unique ID numbers. It is the consumers’ right to verify that the financial institution and/or Loan Officer are registered with the NMLS. The NMLS Consumer Access website is: www.nmlsconsumeraccess.org. A Credit Union Visa® Credit Card gives you a convenient way to make purchases at more than five million places and get emergency cash from thousands of locations worldwide. Record keeping is easy with a monthly Visa® account statement. The Visa Platinum Card offers a low fixed rate with no annual fee. Use this card for purchases and cash advances world-wide. Arrange for automatic monthly payment from your Credit Union account with Direct Deposit or payroll deduction. Click here for online or printable applications. For members who prefer a smaller credit line, our Visa Classic Credit Card also offers a fixed rate with no annual fee. Use this card for purchases and cash advances world-wide. Arrange for automatic monthly payment from your Credit Union account with Direct Deposit or payroll deduction. Click here for online or printable applications. Begin establishing your good credit rating with the Amherst FCU Student Visa credit card. Available for college student ages 18-25, our Student Visa gives you the same great benefits as our Visa Classic credit card with the added advantages of a low fixed rate that keeps monthly payments easy to manage. Click here for online or printable applications. Every card holder is automatically enrolled in the Scorecard Program where you can earn valuable rewards. Receive one point for every dollar spent. Redeem your points to earn all kinds of wonderful gifts including your choice of merchandise or travel rewards. Current cardholders: Click here for more information on this great benefit. You can even redeem your points on the site. Please note that Scorecard Bonus points are not earned for balance transfers. Once approved for one of our Visa® Credit Card products, you are able to transfer balances held at other financial institutions or stores at no charge. This is especially attractive during our Visa Platinum Balance Transfer promotions, during which you may transfer balances held elsewhere onto your new AFCU Visa® at a lower interest rate until the balance is paid off in full. We are proud to participate in the Verified by Visa Program – a free service that gives you password protection when you shop online. It’s safe! It’s free! It’s easy! Review you account information, track spending, set alert notifications, download files, pay bills and much more… Simply go to eZcardInfo.com to learn more about this service and to sign up. *APR represents Annual Percentage Rate. All loans subject to approval, rates may vary from those listed based on term and credit qualifications. Other rates and terms available. Special promotional rates may apply. Please call the Loan Department for details. For your convenience, we are providing online loan calculators to assist you in your financial planning. Please note, however, that these calculators are made available to you only as self-help tools for your independent use and are not intended to provide any investment advice. We cannot and do not guarantee their applicability or accuracy in regards to your individual circumstances. All examples are hypothetical and are for illustrative purposes only. We encourage you to seek personalized advice from qualified professionals in regards to all of your personal finance issues. Amherst Federal Credit Union offers you a number of other free or discounted services.